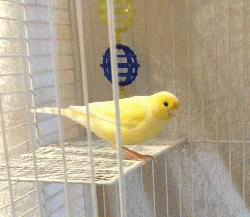 Hi, my name is Molly and I`m a one year old canary girl. My owner could no longer care for me so now I`m in a nice Mickaboo foster home. I`m very personable and will chirp to you when you talk to me. Please contact my adoption coordinator if you would like to learn more about me.